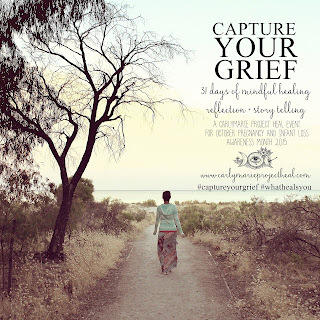 I am continuing my journey through Carly Marie's Capture Your Grief. Will you journey with me? The eleventh subject was GLOW IN THE WOODS. The twelfth subject was NORMALIZING GRIEF. Here is the premise for this topic: "Often while grieving we have feelings of isolation because we fear judgement that what we are feeling isn't normal. But it is amazing to see just how many people feel the same way. When others stand up and express how they feel through sharing their experiences, it allows us to say, "Hey, I feel that way too!" With this topic, Carly Marie has urged us to share something about our grief journey that we may feel is not common but most likely is. Here is my true confession: sometimes, I'm hesitant to talk about Angel, and I hate that. I guess I pause to speak about her because I think many people find it weird that we gave the baby we lost at eight weeks a name. I think they also find it weird that I go out of my way to do things to remember her. My perception is that most people see an early miscarriage as a thing to be moved on from and not an actual child that was lost. This often confuses me because most of my friends claim to be pro-life and support that cause; yet, when someone loses a baby to miscarriage, she and her family are encouraged to move on. You certainly don't give that baby a name and memorialize the child in any way. Yet, that is what we did. That is what I do. It's a way to honor and remember that child, and it is a way to grieve her. I just wish it wasn't seen as "weird." Maybe it isn't? The thirteenth subject is REGRETS + TRIGGERS. I don't really have any regrets concerning my grief - aside from what I said above about being hesitant to say Angel's name, but I do have some grief triggers. August 5th is one of those triggers. The start of August always finds me back in the classroom, and on August 5th, I find my brain can't help but go back to that day when Angel slipped from my body. It remains an emotional day for me. Also, whenever I hear that a friend has experienced a loss of a child - whether it be by an early miscarriage or, like recently, through some tragedy a young child is taken - my loss is lived all over again. Now, don't get me wrong, I would never equate my loss to anyone's loss, each is different. However, the loss of a child, whatever the age, is the loss of a child, and the loss of one's flesh and blood is painful. Period. And whenever a friend has to endure that, I feel the pain of losing Angel all over again. The fourteenth subject is EXPRESS YOUR HEART. For this subject, Carly Marie offers an opportunity to write about whatever is on your heart or mind. The subject that instantly pops into my mind is that of the caregivers. These are the people who go out of their way to be there for you after your loss. I want to give a shout out to them! They don't shy away from your grief. Instead, they want to share in it. And let me tell you, it's a great way to acknowledge the life of the child that was lost. If you are ever so unfortunate to know someone who loses a child, be a caregiver, You can never have enough! I'm so thankful for the friend who made my family a huge meal just a few days after my miscarriage. I'm also thankful for my mother-in-law who did a variety of things to acknowledge and honor Angel's life. I can't say enough about caregivers. LOVE YOU! The fifteenth subject - today's subject - is THE WAVE OF LIGHT! 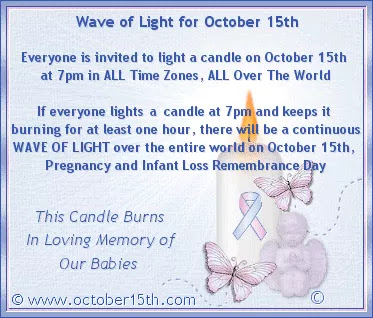 I look forward to participating in the wave of light every year. 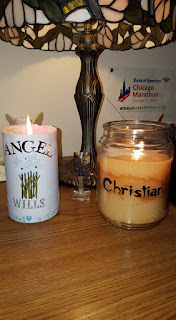 It's the second time of year - August 5th being the other time - that I light Angel's special candle in memory of her and in honor of all babies lost too soon. 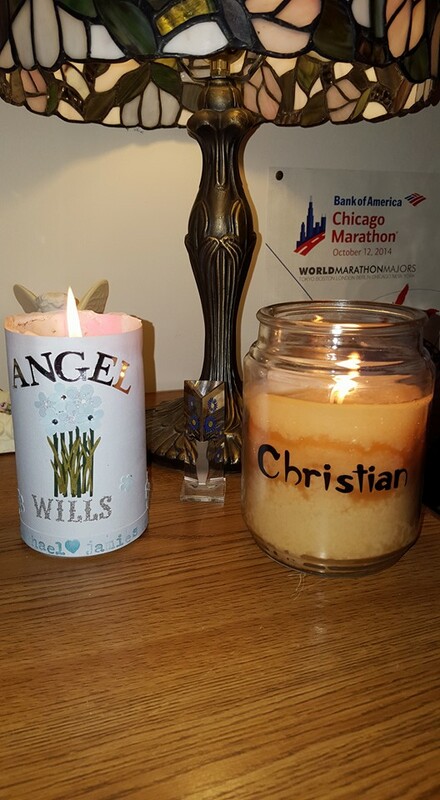 Tonight, I am also burning a candle for five year old Christian, lost this night a week ago. Please, participate with us - whether you are a beavered parent or not. Show your support for those that have lost their beloved children. Show that you remember him or her too. And let me thank you ahead of time for doing it! Today's forget-me-not: Babies lost too soon - no mater the gestation or age.